No it’s not a repeat. It’s true there was a post about the 18thc artist Arthur Devis a few month ago but this one is about his half-brother Anthony. While Arthur specialised in conversation piece portraits Anthony turned to topography and became one of the country’s first successful landscape painters. The Old Hall from the Park, TableyHouse, Cheshire. Anthony’s career spanned more than 60 years and unlike his half-brother he managed to adapt his style to changing Georgian taste and fashion both in painting and appreciation of landscape. Read on to discover how his works give us an insight into the changing perception of nature and the countryside in the 18thc. Anthony Devis was born in Preston in 1729 the older of two sons of his father’s second marriage. Arthur was the older of his sons by his first wife and was 18 when Antony was born. His mother was related to the Lister family, owners of Gisburne Park near Clitheroe in Lancashire, and it was through them and their circle of friends that Arthur seemed to get his early career breaks. The two half-brothers seem to have been close despite the age gap, because when Arthur set off for London to try and establish himself as a fashionable painter around 1740 the 13 yr old Anthony went with him. They must have remained close throughout their lives as Anthony inherited the contents of Arthur’s studio and in turn left his own estate to Arthur’s daughter Ellin. From her it descended to Martin Tupper, the now almost completely forgotten Victorian poet. We have very little other early biographical information about Anthony so one can only assume that he lived and worked in Arthur’s shadow for a while, and certainly no work by him has been dated before 1760. Making a living solely as a landscape painter in the 18thc was extremely hard. Even Gainsborough could not manage it and relied on his portraits for his steady stream of income whilst Richard Wilson had to be bailed out of poverty by his friends in the Royal Academy. Yet somehow Anthony Devis managed it…mainly by providing the elite with views of their country estates, and then by developing a sideline in copying old masters to hang on their walls! From 1760 he seems to have struck out on his own. 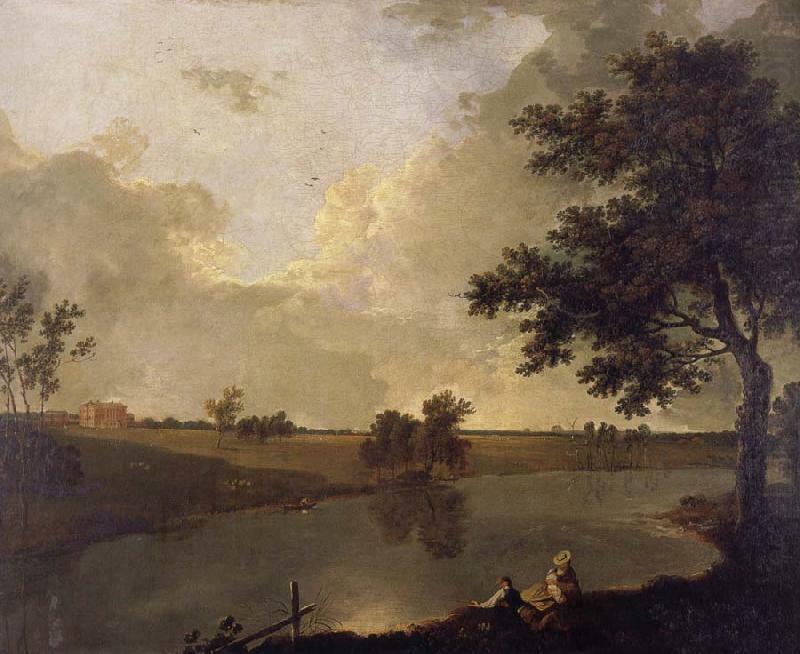 He exhibited at the Free Society of Artists show in 1761 and in 1763 his large landscape “A Cool Morning” won the third prize of ten guineas there. Other paintings on show included views across lands belonging to George Vernon in Glamorganshire. By then Anthony was living in Lambs Conduit Street in Bloomsbury with another brother, John who was a silversmith. Like Arthur, Anthony’s work was popular with northern country gentlemen, and like Arthur too he worked for Sir William Farrington of Shawe Hall. But Anthony travelled much further afield, as can be traced from surviving commissions. He was, for instance, “at the Hon. Mr. Vernon’s, Newick Park Sussex in 1764.” This is presumably the same Vernon who had extensive estates in South Wales. The Vernons had just acquired Newick which had earlier been described as being situated in ‘very healthfull air (in) dry sandy country’. It had a fine walled garden, a 6 acre orchard, 36 acres of woodland and 170 acres of farmland. “On the South West side of the house is a fine Grove of Trees & Rookery wch. Protects it from the only Sea Wind that could affect it and all the Avenues leading to the house are planted with different walks of trees, as Limes, Wallnuts, Chestnut, Elm and Oak..’. They rebuilt the main part of the house which remains largely as today, and carried out extensive landscaping [Historic England] . After a short period as a hotel the house is now once again a private residence. For more information on Newick see our database. Whilst working for the Vernons Devis also seems to have met other local landowners, several of whom became patrons, including John Trower of Muntham Place. Trower collected all sorts of works by Devis, not just those of his own estates, [click here to see more of his collection] an indication perhaps of the growing interest in representations of the landscape amongst the gentry class. Another client was William Aislabie of Studley Royal who had just incorporated the ruins of Fountains Abbey into the parkland created by his father. Devis painted a series of 6 views of the temples and grottoes on the estate. Small in scale they were painted on copper, but are now in private hands in America and images are not available. Aislabie’s work at Studley Royal was heavily criticised by William Gilpin the great advocate of the picturesque. The temples were described as “ridiculous specimens of absurd taste.” Having declared that “solitude” was “the reigning idea of the place ” Gilpin went on to castigate Aislabie’s work as ” a vain ostentation of expense…debauched in it’s conception and puerile in its execution.” and carried on insulting it for a further couple of pages. [Observations on several parts of England] Thank goodness Devis wasn’t responsible for the design, but merely for recording it. Gilpin wanted to be equally scathing about Aisabie’s work at his other estate at Hackfall but he admits to ” a great happiness that the improver of these scenes has less in his power” and whereas at Studley everything “was within reach of his spade and axe” at Hackfall “he could only contemplate at a distance” so the landscape “continued sacred and untouched”. Anthony’s depictions of Hackfall show his adaptability, and how he caught the fashionable mood of the picturesque. In the early 1770s, Josiah Wedgwood commissioned Devis, among others, to produce numerous views of ‘the ruins, country-houses, parks, gardens and picturesque landscapes of Great Britain’. These were intended to decorate the great creamware dinner service –known as the Frog Service – ordered by Empress Catherine the Great of Russia. This project probably helped instigate his extensive travels across Britain, and he subsequently undertook a number of commissions from native landowners. The completed service certainly includes views by Devis of Enville, Staffordshire and Bradgate, Leicestershire. Around 1770 he was at Tabley House, near Macclesfield in Cheshire too to record the new house built by John Carr of York for Sir Peter Byrne Leicester, which was finished in 1769. In this he was in good company because Sir Peter also employed Turner and Richard Wilson to paint the estate and house for him. The last of the Leicester family tried to donate the estate to the National Trust, and when they declined it passed it to the University of Manchester. They have now leased the house to a health care company, and sold its estate to Crown Estates. The grounds are listed Grade II in the English Heritage Register of Parks and Gardens and include Tabley Old Hall which is just a three storey shell with a moat. There are several other listed buildings including a tower folly built in about 1780 on an island in the lake. Amongst Devis’s other important clients was the banker Robert Child, for whom he painted Osterley Park, his London home and Upton his Midlands hunting seat, both of which I’ve written about already [follow the links]. He is also known to have worked for the Duke of Manchester at Kimbolton Castle, John Peploe Birch Esq at Garnston Hall, Herefordshire, Lord Ducie at Woodchester Park and Sir Richard Worsley at Appuldercomb on the Isle of Wight… but unfortunately I cannot trace any images of the paintings he did for any of them. If anyone knows of their whereabouts please let me know. A large number of paintings of other identified sites survive, and help show the peripatetic nature of Devis’s life, and there are, of course, a number of unidentified views and sites. But not content with that Devis also painted imaginary landscapes and views, again presumably catering for a growing market for topographical works. In 1780, Devis moved to Albury House near Guildford in Surrey where he built a mushroom-shaped painting studio [later known as Mushroom Hall!] although there is no evidence of his exhibiting new works publicly after 1781. He certainly seemed to have stopped taking commissions soon after he moved, perhaps to emulate Gainsborough who wanted to go to “some sweet village where I can paint landskips and enjoy the fag end of life in quietness and ease.” [letter cited in Woodall]. For the next 30 years that’s exactly what he did. He painted the local landscape around Albury and created other paintings from sketches that had been bought back by his friends and neighbours from their travels. Anthony Devis died at Albury, unmarried, in 1816, leaving most of his estate to his niece, Arthur’s daughter, Ellin, who had looked after him for many years. However he had ordered that his remaining work should be sold and unfortunately the result is that they are now widely dispersed, and so the range of his work and, for many, even their current whereabouts is unknown. This entry was posted in Uncategorized and tagged Aislabie, Albury, Anthony Devis, Arthur Devis, Frog Service, garden buildings, Hackfall, Landscape painting, Newick Park, Osterley, Picturesque, Preston, Richard Wilson, Society of Artists, Studley Royal, Tabley House, Upton, Wedgwood, William Farington, William Gilpin. Bookmark the permalink.